Civil 3D users â€“ did you know that Map 3D has a specialized drawing status bar? It seems the typical Civil 3D user knows little to nothing about the abilities of Map 3D. As those who do use it know, Map 3D is an incredibly powerful geospatial tool. Autodesk did publish their “GIS Skills for Engineers” document with the release of AutoCAD Civil 3D 2008 and AutoCAD Map 3D 2008. For anyone who has to use GIS data in an engineering environment, the document is a must read. In reading through the document one thing I noticed was its use of a drawing status bar I had never seen before. That got me to thinking, and in true CAD Geek fashion, on a quest for the answer for this little riddle. Finally after fiddling around for some time I was finally able to uncover the answer to unlocking this super top secret drawing status bar. I say super top secret because (to my knowledge) the Map 3D Status Bar cannot be enabled from within AutoCAD. So how does one enable it? 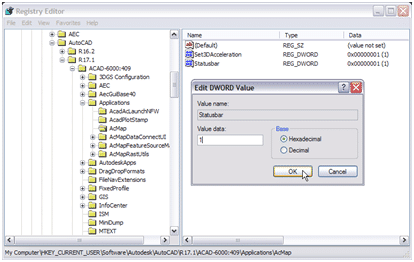 Note the above registry key is for AutoCAD Civil 3D 2008. Land Desktop Companion 2008 happens to be ACAD-6018-409. Other vertical products, including the 2007 releases, will have different values. One of the registry entries is titled “Statusbar”. By default its value is set to “0”. Changing it to “1” will enable the top secret Map 3D Drawing Status Bar. Thank you a lot! Your articles are always great! I also think when use GIS data in an engineering environment, the document is a must read. That got me to thinking, and in true CAD Geek fashion. Type MAPSTATUSBAR in the command line to [Hide/Show] the Status bar also! Thanks. I always enjoy your blog. It’s a great resource. Can you lead me to some systematic instructions on rendering a 3D layout of a civil gradinging projecta?